Large groups travel better when they stay together. Instead of separating between cars, public transportation, or rideshare apps, ride together in a 56-passenger charter bus rental. 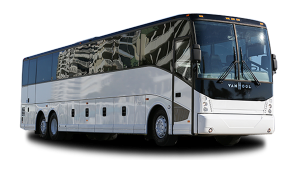 As the most spacious bus rental available, your group will have plenty of space to spread out and stow all their luggage for both short- and long-distance trips. No matter the size of your group or where you’re headed, Champion Charter Bus makes group transportation simple. We help groups of all kinds on every kind of trip, and our 24/7 team can help you plan your next trip when you call us at 1-844-693-9330.